What type of sandals are best for hula hooping? Summer is approaching, which means it’s time for barefoot hooping in the park again! However, sometimes you find yourself limited to a surface that is not appropriate for bare feet. Whether it’s a performance or a practice sesh, floor material is not always in your control. As a performer and an instructor, I will say with confidence, that I prefer to dance barefoot. I enjoy the connection with the ground and I feel unbalanced when I’m sporting footwear. It doesn’t matter how cute my boots are or how rough the ground is…I almost always opt to kick off my shoes…to my own detriment sometimes. This is why I reached out to the hooping community for some new ideas and recommendations. Boots can be too hot for summer shows, and most sandals I’ve tried have proven clunky, awkward, and even painful at times. So what DO I want?! I want a sandal that makes me think I’m barefoot. A lot to ask? Maybe. I also want it to stay put, not shift or slide under my foot as I spin and move, and allow me enough contact with the ground that my balance is not compromised. Oh, and I want them to look good! Huaraches are a 100% customizable and interchangeable. You pick the sole, you pick the colors, and best of all, the sole is cut to the shape of your foot, so every pair is made to fit you perfectly. They even come with a 5,000 mile warranty. You can choose to buy a pre-made pair, buy the DIY kit and do-it-yourself, OR you can send them a tracing of your foot and they will do all the cutting for you! They are designed to make you feel barefoot and the reviews say it’s true. I even had Pennsylvanian-hooper, Rosey Bloom, send me a short video tutorial explaining how she ties her Huaraches for hooping! To begin customizing your very own pair of Huaraches, visit the Zero Shoes website to view your options. To learn how to tie your Huaraches for optimal hooping, check out Rosey Bloom’s tutorial “How I Tie My Huaraches for Hooping” here. If you are looking for something with a little more sole substance, the classic Hooper favorite is Teva sandals. They’re light-weight, durable, secure, and multi-purpose. (You can take them for a hike when you’re done hooping.) Teva offers countless styles, colors, strap designs, and coverage options. While they don’t necessarily make you feel barefoot, they do offer a balanced and secure fit that allows for lots of movement while hooping. Plus they’re light enough to not weigh you down during your jump throughs! If you are looking for a dependable sandal that can get you through your entire day of recreation, Tevas are the way to go. Shop for Tevas here! I would qualify this option as both a modern one, AND a controversial one. You either love them or you hate them. Those who DO love them sing their praises non-stop. But in the interest of transparency, I must admit that I am not one of those people. I have come to the conclusion that they simply do not fit everyone’s feet. My wide, Bunyan-blessed feet don’t fit the glove-like design that many find so much comfort in. Having said that, I also have friends (including circus artists) that swear by them and refuse to wear anything else. So you be the judge of your own feet and give these hi-tech shoes a try! In addition to the standard 5 Finger shoe, Vibram also makes a sandal version, which is popular during summer (hooping!) months. 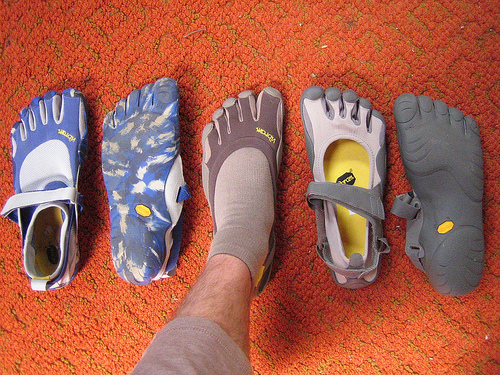 Shop for Vibrams here!